Traditional insights and meditations on universal virtues such as generosity and kindness. When the Buddha had electrified the ancient world with his teachings and his example, people came to him and asked, What are you? A god, a saint, an angel? And he replied: I am awake. Within this statement is embedded the heart of Buddhism's unique position among the world's spiritual traditions. For as the Buddha showed, each of us can overcome the sleep of ordinary consciousness and awaken our hearts and minds to achieve the true freedom that every moment of life offers us. 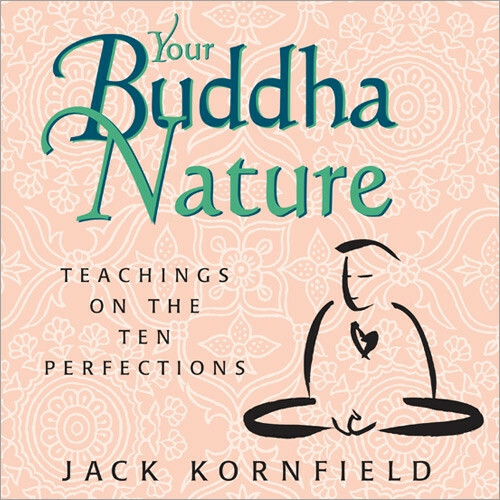 On Our Buddha Nature, you will join Jack Kornfield, one of the preeminent meditation instructors of our time, for a complete course in Buddhism's most basic foundation for mindful living: the Ten Perfections. These perfectionswhich include such universal virtues as truthfulness, simplicity, and lovingkindnessoffer immediate answers to the problems and challenges we face every day of our lives. By using them as keys, Kornfield teaches, we may unlock the human gate to supreme wisdom and open fully to the perfection within each moment of experience. In 12 absorbing sessions, Jack Kornfield introduces you to the Ten Paramitas, or inner perfections, and shows how they can bring a sublime new dimension to any spiritual practice. In simple language, he offers meditations and mindfulness techniques that help you open to the perfections you were born with—which are already deeply rooted in your heart. Joy arises naturally in the moment when you begin this opening practice. Richly textured with ideas, poetry, and teaching parables gleaned from many spiritual traditions, this nine-and-a-half-hour audio retreat invites you to experience the truth of life through awakening your own buddha nature. I bought the audio download version and keep the MP3's on Google Drive so I can access them from my smart phone or a computer wherever I am. I have probably listened to each "lecture" least 3 or 4 times. I find some new insight each time I listen and I highly recommend this to anyone looking to gain a fresh or deeper (or initial!) understanding of the perfections. I find that Jack Kornfield makes the dharma very accessible. These are live recordings and you can hear people laughing, coughing, sniffling, etc. in the background. I very rarely find it distracting. I like that the recordings are live and not read from a script.